If you have been waiting for a deal on the dual-sim variety of the Galaxy S8, then you are in luck. Whether you need it for travel, work, or novelty, availability is starting to pick up. 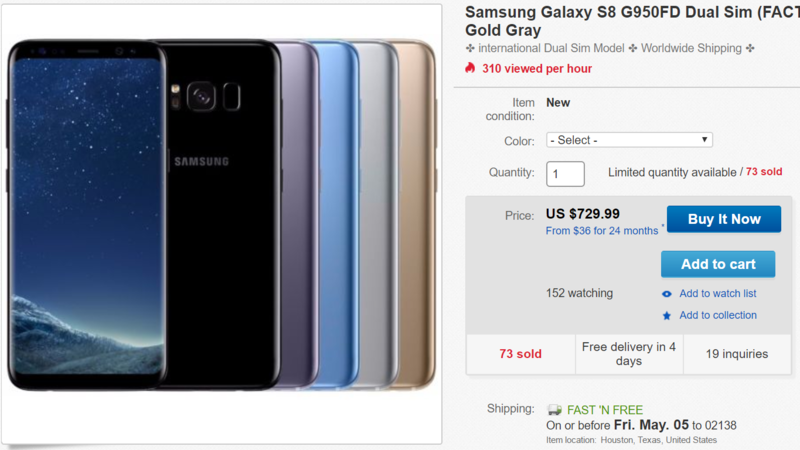 Right now over at eBay, you can grab the dual-sim Exynos version for a cool $730, and the Qualcomm variant runs $820, both of which are less than the inflated prices at places like Amazon. I don't know exactly how much you might be saving if you buy the phone from this seller. Since the phone isn't available yet from most of the typical retailers, it is tough to say. Right now on Amazon, all the options are via third-party sellers and between $840-1000, and most are without detail as to Exynos vs. Qualcomm variants. However, I don't think those prices are likely to be accurate when availability increases. Expansys is the only big seller I have found that is selling it themselves, and even then it's only for pre-order on their Hong Kong site and over $900. What I do know is $730 is by far the lowest we have seen for the dual-sim version of this phone, and your savings are pretty great if you pick it up at this price. A big deal to note: if you are more into the Snapdragon powered variant, the same seller has that model available for $820. The difference between the Qualcomm and Exynos phones is likely to be small, though some early benchmarks pinned the cheaper unit as being faster. The Exynos model is also the only one to have its kernel sources released now, so that might be a consideration if you're looking to toss a ROM on it. You will want to pay attention to the bands supported by your carrier, as these are international versions of the phone. There is no band 12 support for T-Mobile or AT&T, but most other US GSM frequencies are supported. Samsung Pay also may not be supported without a bit of software tinkering. If you're still intrigued, free to pick one up below.